Off the Kerb Gallery is turning twelve and you're invited to their big birthday bash. Celebrating twelve wonderful years in the arts in Victoria, Off the Kerb is gathering an exciting and eclectic group of Melbourne artists together in a large scale charitable group exhibition entitled Animalia. Showcasing the many and varied works of 50 talented contemporary artists and street artists, this exhibition is a celebration of life on our planet and explores our symbolic, metaphorical and literal relationship with animals. In their submissions for this show artists were asked questions such as, How has the natural world affected your life growing up? Are there particular creatures or natural environments that inspire you or capture your imagination? Creature Creature comprises an artist duo consisting of Chanel Tang and Ambrose Rehorek, who describe their art as having "strong contrasting elements from our collaboration which is about preserving diversity and turning it into something unique and whole. The colours and compositions are our way to use design principles to express who we are and what we advocate: balance, harmony, repetition, movement, complexity, layered and fluid." They use drawing materials and acrylic paint, often on wood surfaces, as they find this surface to be very forgiving and stable when they attack it with different mediums and layers. They also find it fits well with their subject matter that often refers to the natural world and its magic. 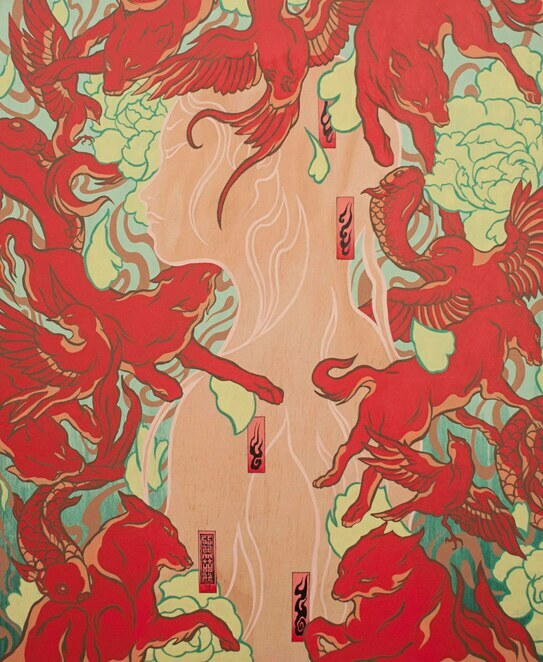 In the striking works of Creature Creature you will often see animal motifs, especially wolves, fish and birds. The artists explain further, "We pick these animals as they are often creatures who spend their lives in a pack, flock or school, and work together to receive the benefits from this. This is a philosophy we try to promote as collaborators, not just in creative practices but all aspects of society. The connection you foster with a community is important for our survival just as it is with these other species." For this exhibition the piece they have chosen is titled 'Aura'. The central figure in the work is surrounded by an ambience, exploring the theme of what humanity can learn from nature and other living things. Another inspiring artist joining the show is Brian Cheung who has spent recent years exhibiting in Melbourne as well as travelling to various artist residencies both within Australia and overseas. He has spent time furthering his practice in residencies in Iceland, Shetland and Scandinavia as well as closer to home in Queenstown Tasmania. Primarily drawn to analogue mediums, recurring themes in his work include ideas of natural progression, passing time, cycles and patterns. Recent works explore the interaction between man and nature, in the form of natural motifs painted repeatedly into unnatural grids and mandalas, or as tessellating forests of flora and fauna pretending to be wallpaper. At a glance, viewers might assume his paintings came together easily with the help of technology, however, it is crucial and impressive to realise they actually represent countless hours of painstaking and laborious work. Brian's piece 'Orchid Field' continues along this direction although adding in a smooth gradient to heighten the sense of unreality. 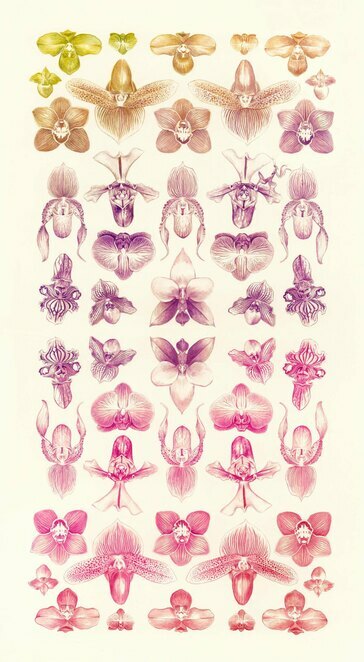 Brian explains the inspiration behind this piece, "Orchidaceae is already a huge and fascinating family of plants, but they have also figured out a way to draw in collectors and enthusiasts to obligingly harvest, collect, cultivate and hybridize them further into the many thousands of stunning varieties that exist today. " 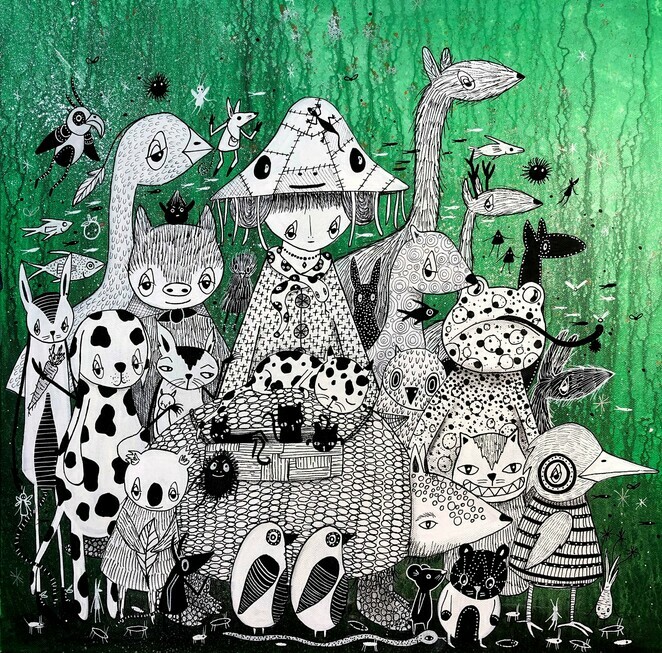 Barek is a Melbourne-based street artist working out of Blender Studios. Not limiting himself to street art you will also find his unique and whimsical work in solo exhibitions, group shows, workshops and you might also be lucky enough to run into him as a street art tour guide with Melbourne Street Tours. In his artistic practices Barek explores all aspects of life, "the light, the dark and everything in between. I make art that leaves the viewer to choose the story within it and art that you can look at over and over again to discover more." Most of Barek's work is a mix of materials, using whatever is needed to produce the desired effect. His skills include working in acrylic, ink, aerosol, charcoal and pencil and he is just as comfortable painting large scale as he is with small. For the Animalia Exhibition the artist tried to choose a favourite animal to paint, but found he couldn't pick just one. Lucky for us as he chose instead to paint a whole parade of animals including some imaginary beings, and the resulting work 'Animal Parade' is simply delightful. Another artist to contribute to this diverse show is Tinky, a resident installation / street artist at Blender Studios, where she creates humourous miniature dioramas. When asked to describe her art she explains, "I think it crosses a few areas. It's street art that has also become gallery art; however, it's pun-ridden and meant to inspire a good chuckle, so it's comical too. One day I'll be moving a skip-bin in a dirty laneway to find the perfect hole-in-the-wall for an install; the next week I might be preparing a piece for a gallery exhibition. I love that it's so fluid like that, and that it can be appreciated in different urban settings. And when I see someone laugh, well, I'm as happy as a lark. I always laugh at my own jokes but it's even better when someone else does too." Tinky uses vintage and found objects in her work, such as old cigarette tins, plastic toys, taxidermy, vintage fruit, old wooden objects etc, as well as industrial-strength glue to keep everything in place. Her piece for Animalia centres around a vintage taxidermy crocodile head, which has belonged to a family member since the 1970s (complete with an original sticker that reads "Approved product of Queensland Government"). The diorama features a renovation scene and is captioned, "The renovation team thought the site foreman's OH&S rules were a total croc, until Ali decided to scale the scaffolding without a harness. It was a silly snap decision on her part." Not only does the exhibition promise to be a great way to enjoy and perhaps purchase inspiring artworks, but it is also an opportunity to support a charitable cause, as Off the Kerb is generously donating 10% from the sale of artworks to grassroots charity Signal Hill Sanctuary. "Every April when Off the Kerb turns a year older, I am almost surprised and startled that we survived the ever-pressurizing environment of the Arts. As a way of giving back to the community that has stood by the gallery all these years, I decided to support a charity for the anniversary shows. This year, I was compelled to support Signal Hill Sanctuary, which provides a safe and caring home for abused, neglected or unwanted farm animals. Signal Hill Sanctuary in Yass River, NSW is severely affected by the drought. While farmers are receiving drought appeal, the sanctuary is not, as the government does not consider it as a "Commercial Farm" instead, a "Rescue Organisation". Second to art, animal welfare is a priority of mine." The important work of Signal Hill Sanctuary includes rescuing abused and unwanted animals from animal agriculture industries, educating the public, raising awareness and providing opportunities for humans to meet and connect with the rescued animals. The Animalia Exhibition will commence at Off the Kerb Gallery on 11th April and will run until 25th April 2019. Opening night is on Friday 12th April from 6pm - 9pm. Off the Kerb Gallery is located at 66B Johnston Street Collingwood. The Gallery is open on Thursdays and Fridays from 12.30pm - 6pm and on Saturdays and Sundays from 12 noon - 5pm. The Animal Parade looks great wit the black/white character contrasting the green background.